Last November, I wrote a short blog arguing that inflation was not dead. In fact, significant parts of the economy showed inflation was on the rise. This was, however, completely overlooked as the ongoing collapse in energy prices dominated all inflation-related headlines. Now, a couple of months later, things look even more extreme. Oil prices fell further and so did inflation expectations. And not just expectations for the coming quarters. No, long-term inflation expectations have come down as well. For example, the US 5-year 5-year forward breakeven inflation level, reflecting inflation expectations five year out, fell to the lowest level since the outbreak of the financial crisis. As this article from Bruegel neatly points out, long-term inflation expectations are largely effected by (short-term) changes in energy prices, which is ‘puzzling’ at best. Especially when you take into account that inflation in the parts of the economy that I mentioned above has not slowed at all. Hence, this update. 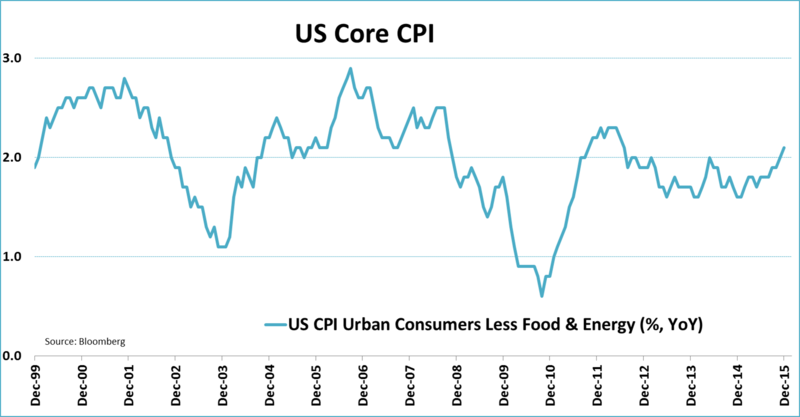 Core CPI, inflation after stripping out the effects of energy (and food), came in at 2.1% in December. 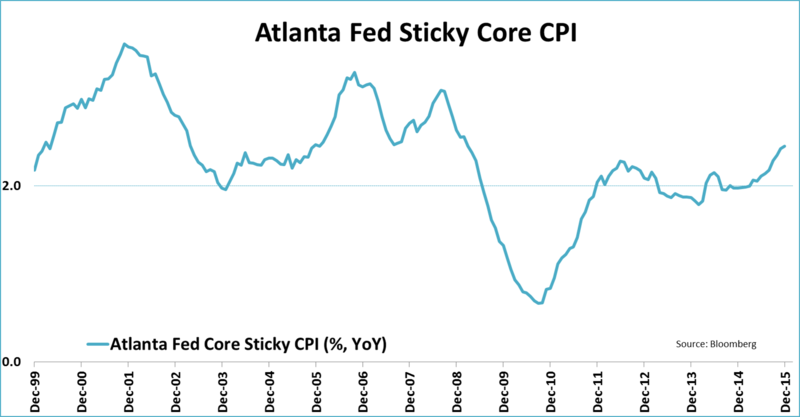 For a very long time this has been a pretty satisfying level of core inflation for the Fed. Neither too high nor too low. On top of that, core inflation has risen since my previous post in November and the current level is actually higher than the average core inflation since the start of this millennium. As a result of a massive collapse in oil and other commodity prices the US economy was split in two. Basically, the manufacturing sector is in a recession, while this is not the case for the non-manufacturing sector. 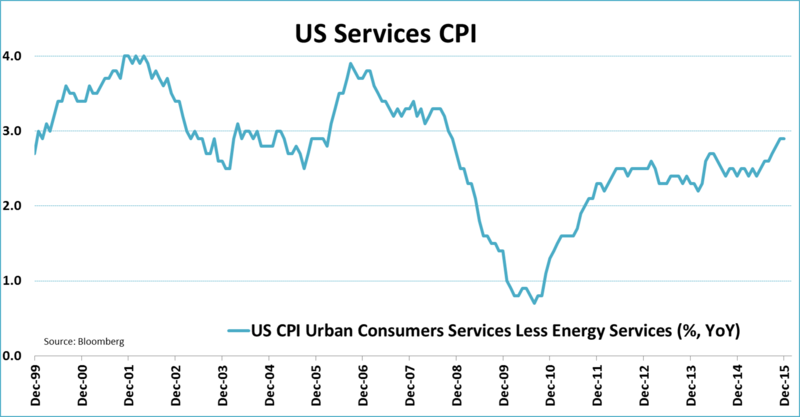 Hence, the services CPI looks much more upbeat than the overall number. At the end of 2015 services inflation equaled 2.9%. Again this was slightly higher than back in November and also above the average since the start of 2000. The story of this major component of US inflation, which basically looks at what homeowners would pay if they were renting their own dwellings, is similar to the two above. 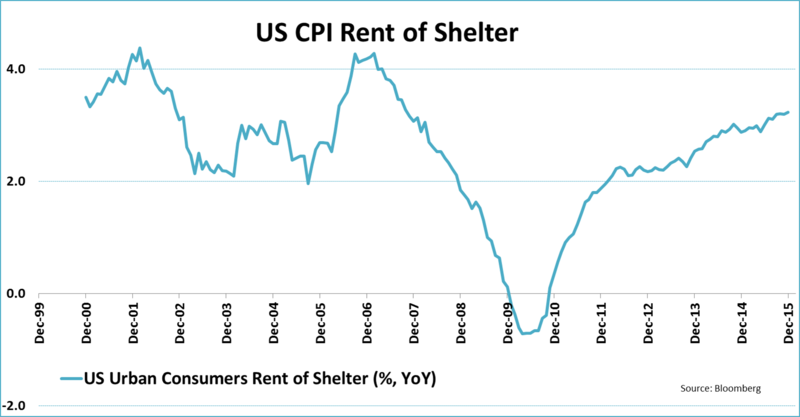 There is one difference however, current shelter CPI at 3.23% is not just above average, it’s way above. That doesn’t look dead to me. 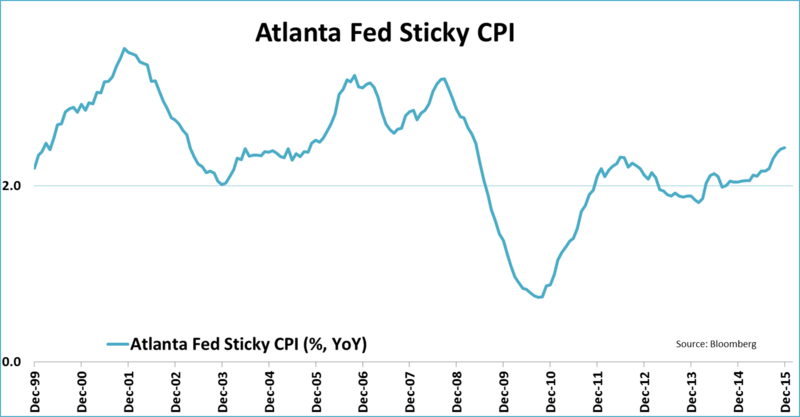 Precisely because of the (temporary) effects of certain items, like energy, on the headline CPI number, Federal reserve banks look for more ‘representative’ inflation indicators. 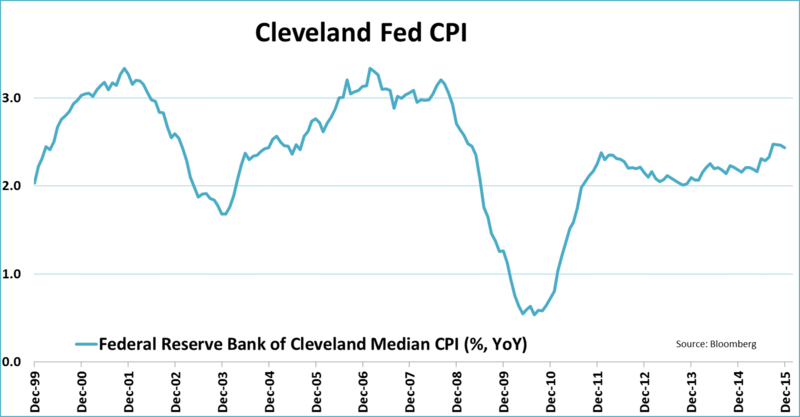 The Cleveland CPI is one of them, as certain volatile items are stripped out to give a more robust view of inflation. This measure has been very steady in recent months, at a level of just below 2.5%. A very healthy level of inflation and once again slightly above its average since January 2000. Last but not least, wages are rising. 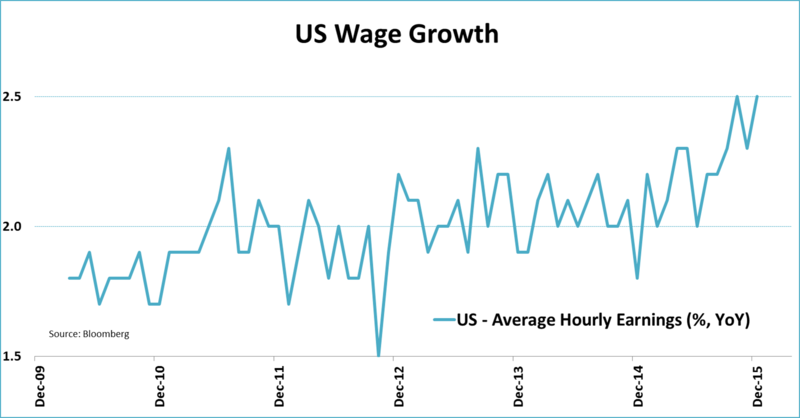 Certainly not as fast as before the financial crisis, but the pace of wage growth is gradually increasing. And this includes the recessionary manufacturing sector. ← The Current High Yield Spread – What to make of it?